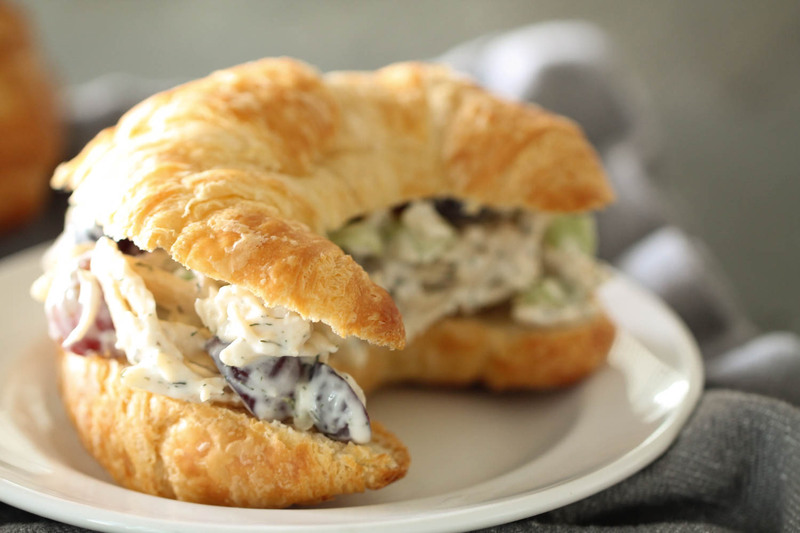 Can you guess the secret ingredient that makes this Chicken Salad Sandwich taste better than any other? Ranch dressing! You'll love how easy these flavor-packed sandwiches are to throw together for dinner or your next party. You may be a little skeptical on this secret ingredient, but we can promise that you’ll love it. Who doesn’t love ranch dressing?! The ranch dressing in this chicken salad sandwich recipe gives it a creamy texture while the dry dressing mix packs it with extra ranch flavor. It may sound like a lot, but you will need both of these ingredients to give this chicken salad the very best flavor. Ranch dressing and ranch dressing mix can be found on the same aisle in your grocery store. The ranch dressing packets are usually found above or below the ranch salad dressing in 1-ounce packets. This recipe calls for 1/2 cup prepared ranch dressing and 1/2 packet of the dry ranch dressing mix. We usually use the Hidden Valley dry ranch mix, but store brand works just as great. A lot of chicken salad sandwiches have vinegar in them that can make them taste pretty acidic. I love how creamy this Chicken Salad recipe is and my picky eaters agree! We love chicken salad with grapes, but some don’t. That’s ok! We’ve had a lot of readers send us in their own versions of this recipe. 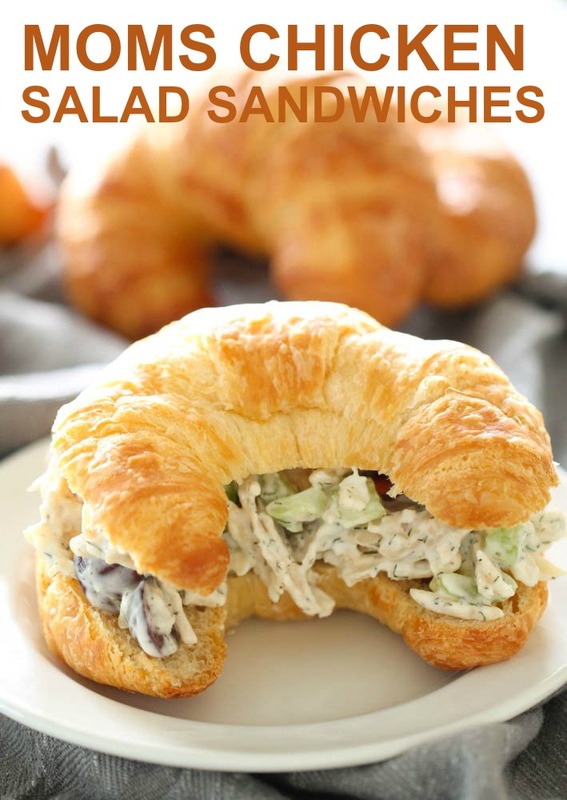 Here are a few ideas to switch up your chicken salad and make it your own! We’ve even had a few readers tell us they prefer to place their chicken and vegetables in the food processor before mixing with their liquid ingredients, to get that restaurant style Chicken Salad Sandwich texture. This recipe calls for 3 1/2 cups diced, cooked chicken. We’ve found it easiest to boil our chicken for this chicken salad recipe, but any cooking method will work. Allow chicken breasts to fully thaw and rinse in cold water. Fill a pot with water and place chicken in pot. Make sure your chicken is fully submerged in the water. Place pot on the stove and bring to a boil over high heat. Once boiling, reduce heat to low and allow the chicken to simmer for 20-25 minutes or until the internal temperature of the chicken reaches 165 degrees. Remove pot from heat and drain liquid. To assure your chicken is cooked, cut through chicken and make sure the middle is white and the juices run clear. Another shortcut we love in this recipe is using rotisserie chicken. Most grocery stores sell already pulled and packaged rotisserie chicken in their deli, making this chicken salad even easier to throw together. 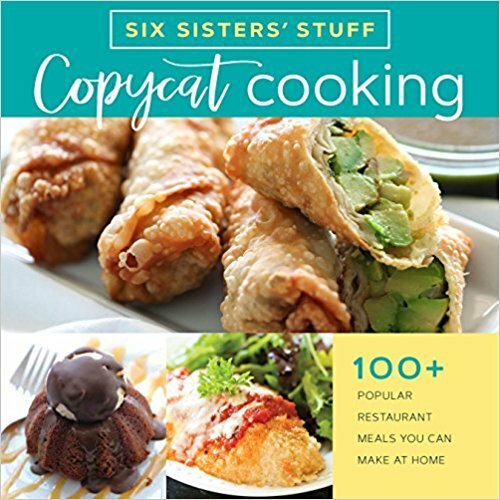 Looking for more easy recipes just like this one? In a large mixing bowl, combine mayonnaise, buttermilk, prepared ranch dressing, dry ranch mix and dill weed. Gently mix in cooked chicken, almonds, grapes and celery. Refrigerate for at least 1 hour and serve on croissants. 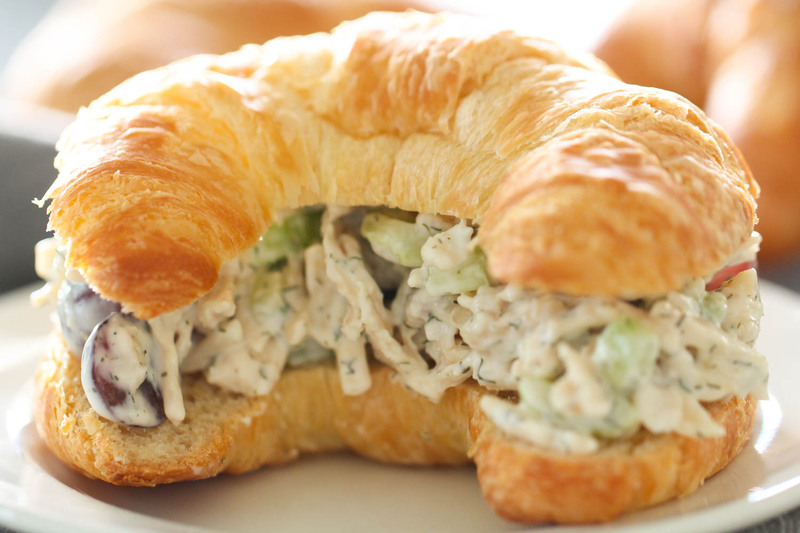 Watch us make our Mom’s Chicken Salad Sandwiches in this video! ". . . mix the dry Hidden Valley ranch dressing with the liquid ranch dressing"? I don't see liquid ranch dressing listed in the ingredients. Am I missing something? The liquid ranch dressing is above the dry hidden ranch. I have same question as Patricia - I do not see anything in recipe regarding liquid ranch dressing??? Help please! First thing I noticed... liquid ranch dressing?! I think this recipe has an error????? Doesn't make sense..... please explain..tks! Haha! I pretty much made the same recipe last night, except it doesn't have ranch dressing in it--but lemon juice and zest, and I used peppered mayo. YUMMY! No dill on hand though, so I used thyme. Is liquid ranch dressing just any regular ranch dressing? Does the powdered just make it more intense? Liquid ranch is just your regular ranch dressing. The powdered just gives it a more ranchy taste! Delish!! The dry ranch really makes this come alive.